Whether you’ve never heard of Staph or MRSA before, or if you’re scared because you have heard of it, or if you’re just trying to figure it all out, you’ve come to the right place. I want to help you get a clear understanding of what these infections are, the signs and symptoms you can look for, how contagious it is, and if you been diagnosed, how you can get the best treatments to overcome it. While there are certainly scary stories about this disease, I want you to know you don’t have to live in fear. What symptoms and types of infection should you be aware of? The bacteria Staph and its “ugly cousin” MRSA (pronounced “mer-suh”) have been gaining a lot of attention in recent years. Why? It’s because they have moved from being well-behaved and non-threatening to people, to causing dangerous and downright deadly infections. Typical signs and symptoms you should be aware of include many types of skin infections, but it can also cause more dangerous internal infections. Skin infections can range from rashes, pimple-like areas and more obvious infections like boils or cellulitis. I’ve also included pictures of common skin infections which can help you know what MRSA looks like. What’s most worrisome is not only can MRSA or Staph infect the weak or elderly, but that they can also attack the young and the healthy. There are many types of Staph bacteria, and they commonly reside on both people and animals. For the most part, they are well behaved and never cause problems for many people. When they do cause issues, it’s typically a type of skin infection, however, they can move from the skin to inside your body and cause dangerous internal infections. 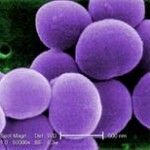 The trouble is, some Staph bacteria changed and began causing deadly and difficult to treat infections. MRSA is the most serious bacteria in this family, because it’s immune to most commonly prescribed antibiotics and it can be very had to treat. A little knowledge goes a long way toward protecting yourself against these bacteria. Despite how clever these bacteria can be, you can stay a step ahead if you arm yourself with the facts. Look to the left for the blue navigation bar for links to help you understand the differences between Staph and MRSA, symptoms, pictures, how contagious they are, can you get better, and more. You’ll also see help sections at the top menu for prevention, exploring treatment options and how to help others. How contagious is MRSA and how do you catch it?